After a long day doing a horseshoe tour of Penghu Main Islands, we checked in at 天邊海角民宿 at 澎湖馬公市 (Penghu Magong City) for a quick rest before exploring the evening food scene at Magong City. 民宿 (the Anglicized version – Minsu) refers to Homestays in Taiwan. It is a common form of accommodation typically found outside big Taiwanese cities and it provides guests with a more homely feel and personalised interaction with the owners of the Minsu/Homestays. The owners will sometimes cook meals for the guests (if included in their package) and arrange for tours of the area (through their contacts with local tour operators). Besides personalised services and interactions with the owners, some Minsu provide a very unique experience through beautifully-themed rooms targeted at different guests e.g. honeymooners, families. 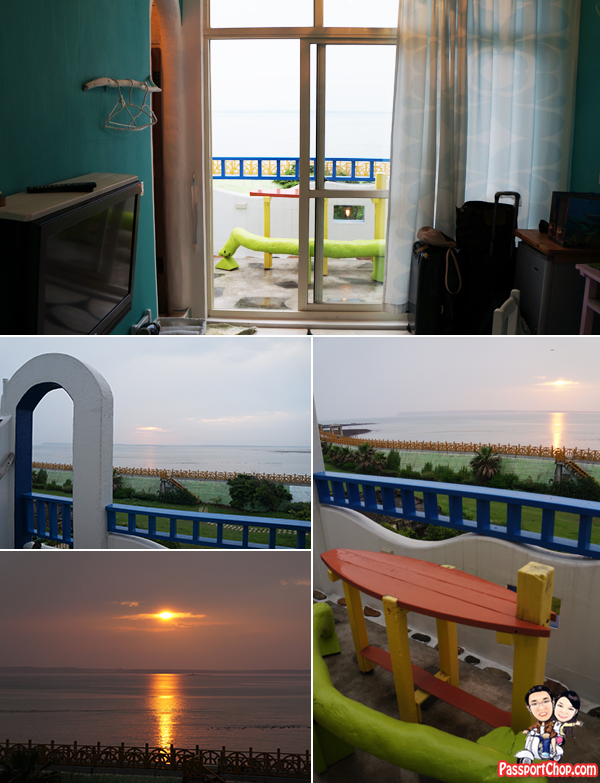 The Minsu we checked out at our first night in Magong City, Penghu is 天邊海角民宿 – literally translated as Cape Horizon Homestay. 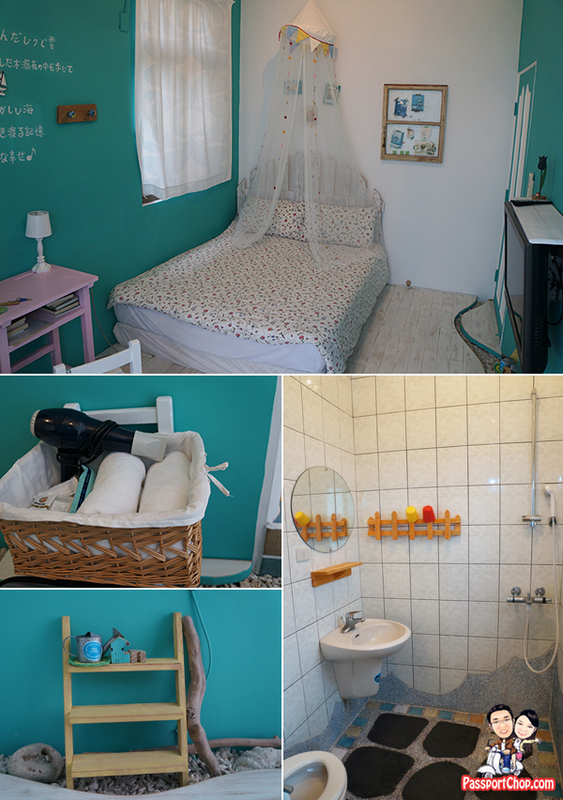 This is one Minsu which offers rooms with different themes from 綠森林 (green forest) to 幸福燈塔 (happy lighthouse) and with great views of sunset over the seas around Penghu. 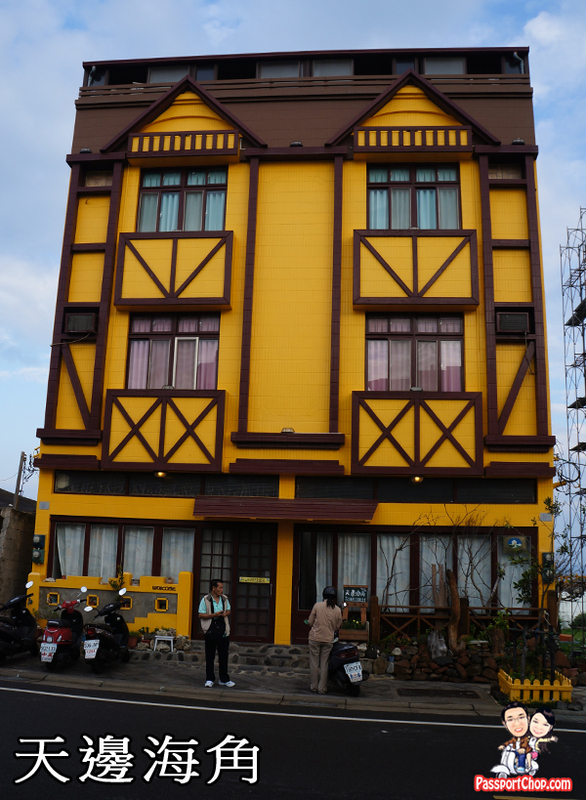 You can’t miss this Minsu as it stood out from its surroundings with its yellow Victorian-style European English house facade. The owner of 天邊海角民宿 has been in the Penghu Minsu scene for quite some time now – 幸福工廠民宿 (literal translation: happy factory minsu) was one of his first Minsu in Penghu before he setup his 3rd and newest Minsu – 天邊海角民宿 in 2010. What distinguishes 天邊海角民宿 from his other 2 Homestays/Minsu is its close proximity to Magong City (just 10-15 minutes leisurely walk to the city centre from the Minsu) and its great sea view. What was just as impressive about 天邊海角民宿 was that the owner conceptualised the 8 different themes for each of the rooms in the homestay and took a very hands-on approach to piecing each wooden plank, pebbles, stones together to create the different themes. We stayed at the 看海趣-themed room (literal translated as fun & enjoyable sea view) at Level 3 which comes with a balcony (陽台海景雙人套房). The room is quite small but well-equipped with the necessities e.g. hairdryer, shaving kit and other toiletries. Clean bath towels are also provided. The room is also equipped with a mini-fridge, flat-screen LCD TV and best part of all, the room is air-conditioned – perfect if you are here in Penghu during the hot summer period. The bathroom/toilet is spacious and shower facilities were great (strong water pressure with easy temperature control). Free Wi-fi is also available (at the time of stay (early May 2013), the Wi-Fi signal was very weak in this 看海趣 room and they were fixing it – do check if it is fixed if having Wi-Fi access is important to you – you can access Wi-Fi downstairs). Such relaxing and free time is my own private happiness. This room is themed 看海趣 (fun and enjoyable sea view) and it comes with a spacious balcony with a thick tree branch shaped as a stool (not sure about the weight limit though :-)) for guests to check out the sea view from the comfort of their private balcony. The color scheme on this side of the house is based on the Greece Santorini (blue-white themed) seaside coastal village. The sunset views from 天邊海角民宿 minsu is indeed beautiful so don’t miss it when you are staying here. Per night room rates at 天邊海角民宿 start at 2,400 NT (about S$100). There are discounts if you stay at 天邊海角民宿 for a night or more (starting from a discount of 400 NT for the first night to 800 NT for the third night onwards). 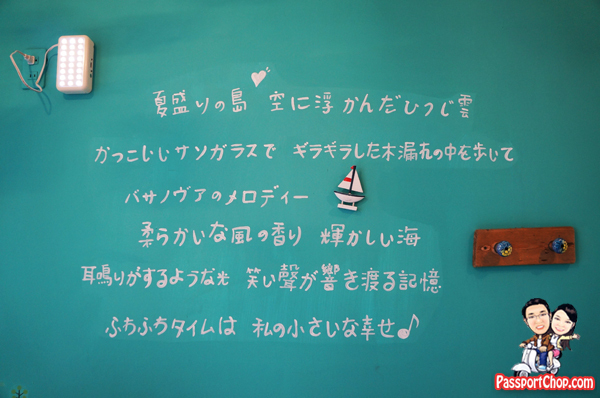 The 看海趣-themed room we stayed in is priced at 2,600 NT. Do note that meals are not included – no breakfast is provided. You can check out the nearby Yong Kang breakfast street (about 10 minutes walk away) for your breakfast – also note that there are no common kitchen facilities available (可到鄰近的文康早餐街享用，一樓並設有公用廚房提供自助使用). Free parking is available around the minsu. 路邊白線內皆可免費停車. Check-out timing is at 10.30am and Check-in timing is at 3.30pm. You may leave your luggage at the reception if you have to check-in earlier or check-out later. Do note that the reception is closed at around 6pm and there won’t be any staff member at 天邊海角民宿 after 6pm. Guests will be provided with house and room keys and are expected to lock up everytime they leave the house or come back. To book your accommodation at 天邊海角民宿, you can call this number (0985319121) between 9.30am to 9.30pm (訂房時間: 09:30~21:30). For more information, check out the minsu’s website at http://a1802043.myweb.hinet.net (do note that the website is completely written in Traditional Chinese). A taxi ride from the Magong airport to the city of Magong should not cost more than 300 NT (about 12 – 15 Singapore dollars). However, if you are able to telephone and book a taxi (at either 0937713723 or 0931873045) ahead of your arrival in Mandarin Chinese, the cost can drop down to 200 NT. What I find unique about this Homestay is that, it is almost hotel like, with reception check in and check out times. Concept of having themed rooms is interesting and balcony opening to the sea, must have been a sheer delight. I would love to visit the place, but one question, since I am a vegan, are there any eateries there, which serve the vegan food? I am sure you will be able to find some vegan food at Zhongzheng Road.